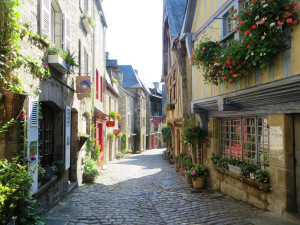 Since medieval times, the village of Rocamadour in the Occitanie region of southwestern France has attracted pilgrims from across Europe for its historical monuments and its sanctuary of the Blessed Virgin Mary. As per usual, the summer has flown by all to fast for some of us. I must admit that I include myself in those numbers. However, the Autumn does have some delicious things going for it and what could be better than French wine? One might imagine that things get rather quiet in a small rural village after the tourist season draws to a close. Yet, that is not the case. 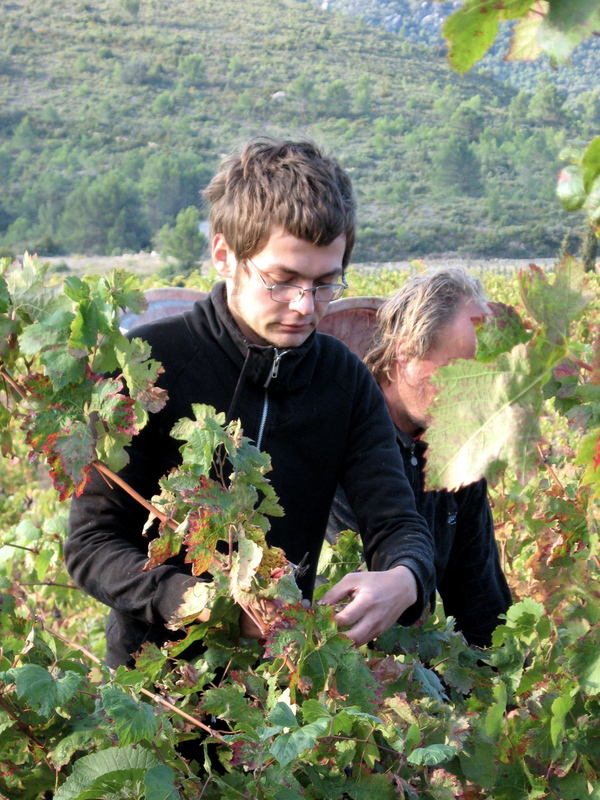 As early as late August, the vignerons begin the harvest. There will be some unfamiliar faces as young people from all over europe arrive to help get the raisins (grapes). From before seven in the morning until the last shards of light fade away the streets are a hive of tractors, grape harvesters and vehicles filled with pickers on their way to the vineyards and large trailers brimming with freshly harvested grapes. The Languedoc-Roussillon is the largest wine-producing region in France. More wine is produced in this one small region than in the entire United States. 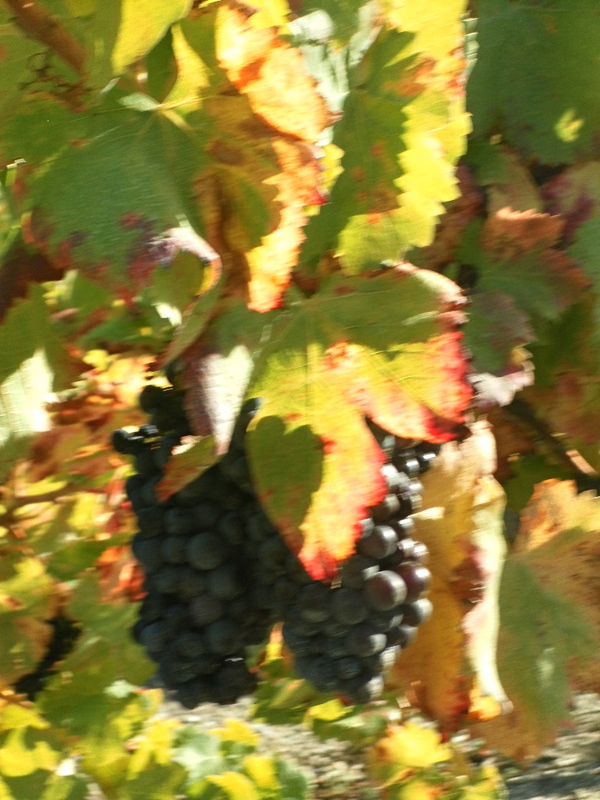 A wide variety of grapes are grown here such as Grenache, Syrah as well as Chardonnay and Cabernet Sauvignon. While Languedoc wines cover a rather broad spectrum, from white to red; sweet to dry and of course sparkling which pre-dates Champagne (but that will be another post and another time). The region proudly cultivates the vines on over 700,000 acres here along the Mediterranean coast. It is thought to be the single largest wine-producing area in the world. 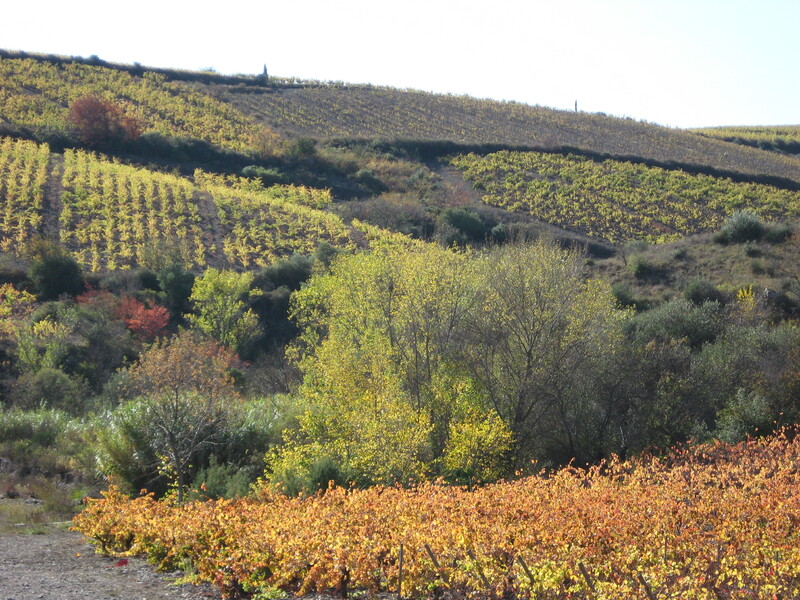 The Languedoc-Roussillon is arid, warm and brimming with sunlight. 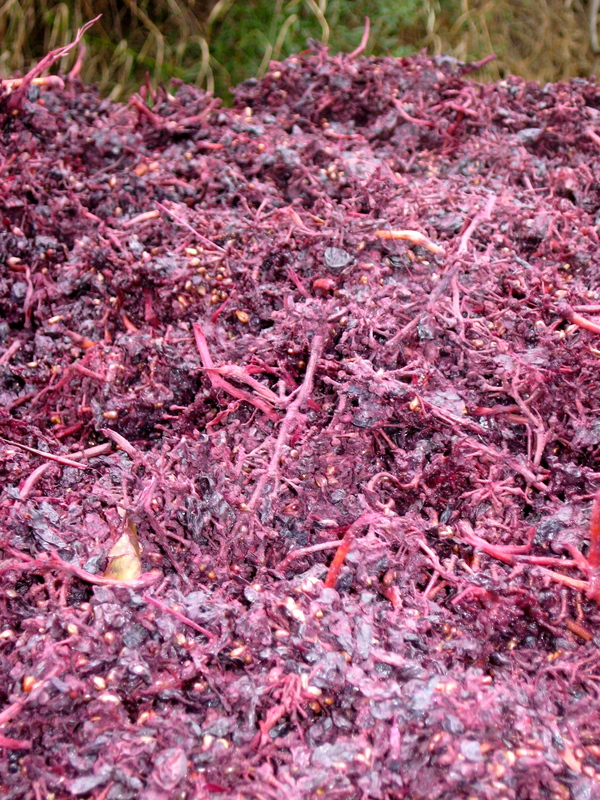 The rugged terrain of herbs, brush and resinous plants infuse the wine with their scents and flavours. 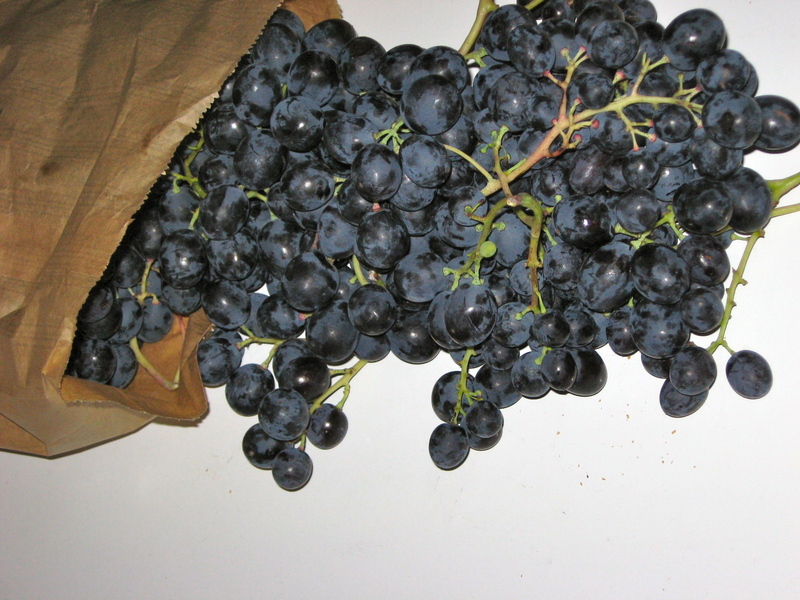 It is the ideal terrain and climate for growing grapes. 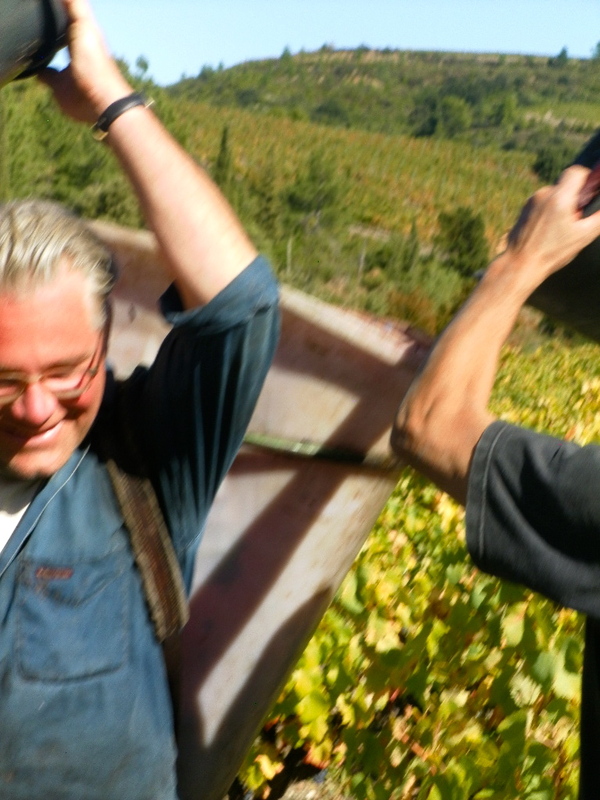 While the quality became secondary to quantity for a time in the early twentieth century the hard working vignerons committed themselves to turning it around with remarkable results. A neighbor, Remy, makes a lovely collection of organic wines and also grape juice. If I am lucky, I can buy a few of the days pickings that did not end up in the vats. Gait is a manager for Remy and has the “honor” of having the buckets of grapes from all the pickers loaded into the large container on his back (porter). 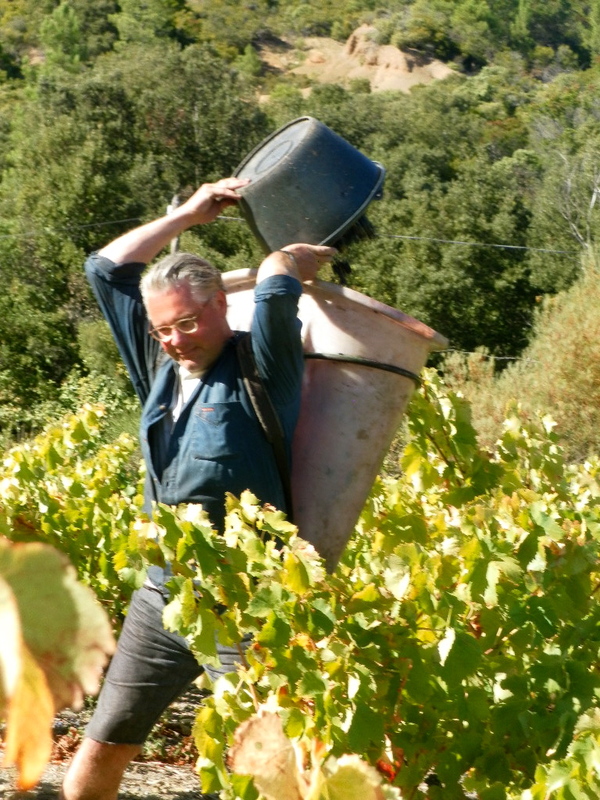 Being quite tall, he must bend to allow the pickers to dump the fruit into the container on his back which quickly fills. He follows around all of the people who are cutting the clusters of grapes and then transports his container when filled to the trailer which will quickly be transported back to the cave and on its way to the vats. While it is true that large machines harvest a vast amount of the grapes, a number prefer the hands on approach. Additionally, some of the terrain is such that this is not a viable option. Most of the workers are seasonal and some speak little french. The perfume of fermenting grapes begins to fill the air as fêtes de vins fill our weekends with tastings, dances, music and more. They last well through November even though the last grapes have been harvested. While these photos are all taken at Domaine Sainte Juste, and Embres – Castlemaure there are a several wonderful options in just this small village alone (pop. 700). There are many more vineyards just a few kilometers away. 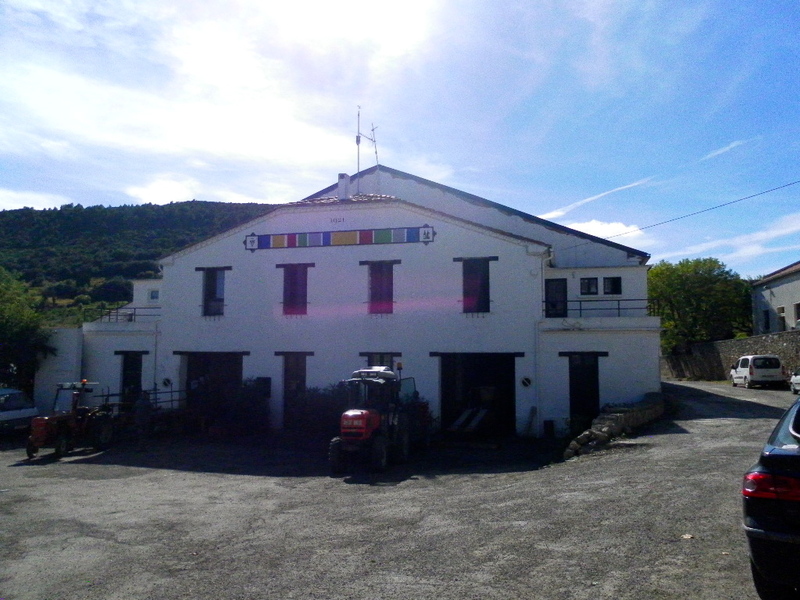 Embres – Castlemaure is a cooperative and Durban has a wide variety of Vigneron (wine grower) There are at least thirteen seperate caves here. 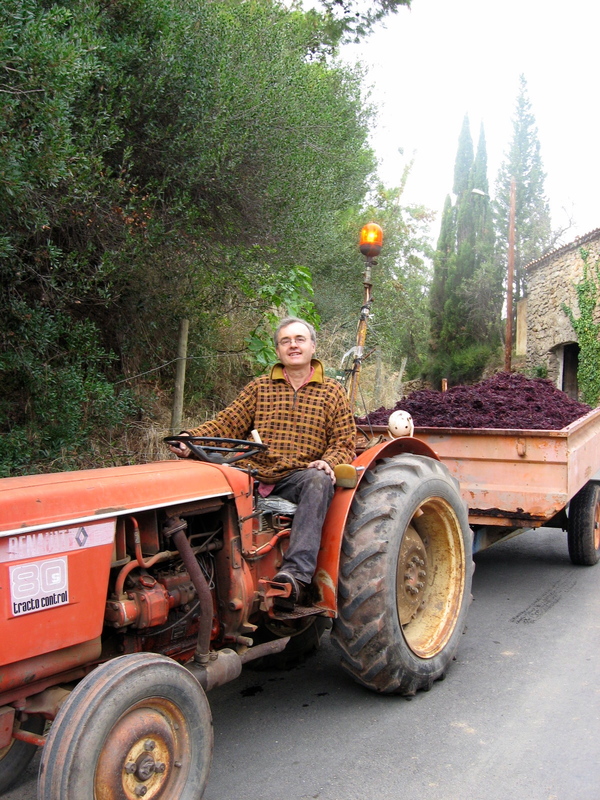 In addition, there are many who have smaller vineyards and make wine just for personal use or sell to a cooperative. If you want a workout, try your hand at the porter’s job. The receptacle on his back hold 60 kilo or just over 132 pounds. They carry those on their backs up hill and down for several hours a day during the harvest. If you want an extreme workout, try the porter’s job. The receptacles they carry on their back hold 60 kilo or a little over 132 pounds. They are carrying these up and down hills and then taking them to the awaiting trailer to be hauled of to the cave. Fill those containers and keep moving! In our village, a huge party is hosted after the vendange for all who participated. There is music, dancing and refreshments. This lasts well through the night. Alas, this year, March was quite warm and enough to coax out those early shoots. April followed with two separate nights of frost and destroyed crops all over France. While some did not have severe losses, one of our local vignerons reports a loss of about twenty percent. Losses could be found on one side of a road with the opposite spared. With the wine safely pressed and in the vats, the wine festivals commence. They are everywhere and one can pick and choose which to attend.